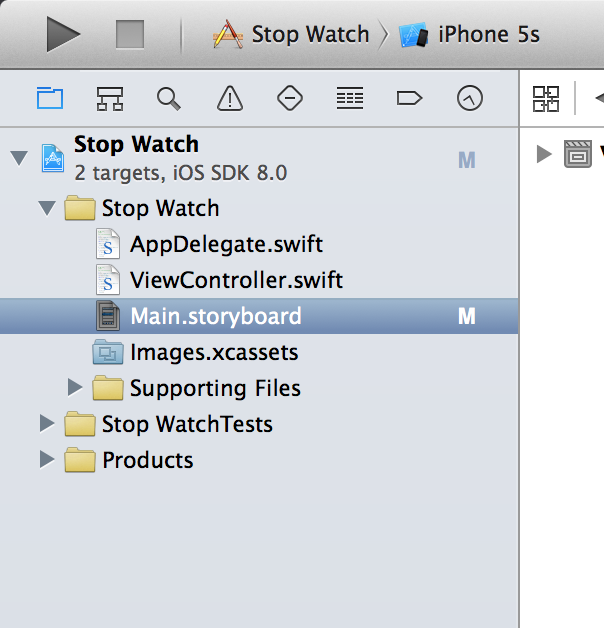 In this tutorial, we will create a single view iOS application using the Swift programming language. The tutorial will provide some insight into basic usage of the Apple Xcode integrated programming environment, as well as the model/view/controller software architectural pattern. Our target audience are people who have some prior experience in application development and programming but who are relatively new to Xcode and iOS development. 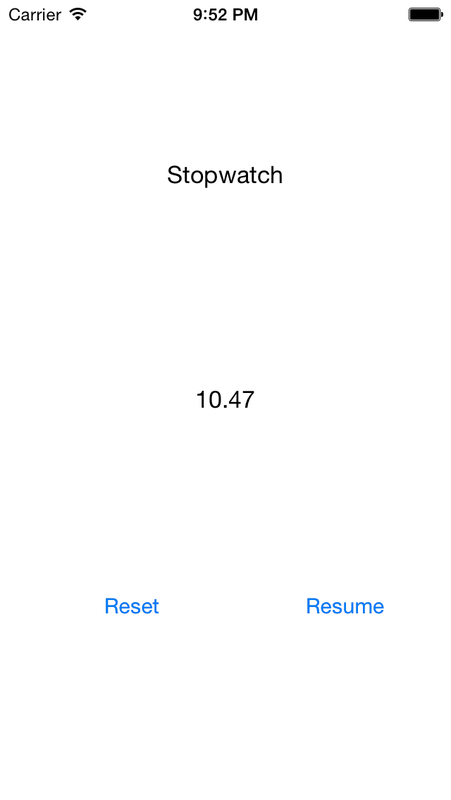 The project goal is to build a simple iOS stopwatch-style timer application designed for iPhone using Swift. The app will contain two labels (one for our title and one for our numeric timer display), and two buttons (a start/stop button, and a reset button). We will first lay out our main view, which will contain these elements and then use the interface builder (i.e. storyboard) to hook our view into the controller (IBOutlets and IBActions). Finally, we will turn to the business logic of the app. In the end, we will have two imports and a view controller. We will add three methods to the view controller class: two actions methods and one helper method. The tutorial will be broken down into a series of just over thirty steps with screen caps to provide a quick visual aid. The first thing you'll need to do, if you haven't already, is download the latest version of Xcode 6 (currently in beta as of this writing). 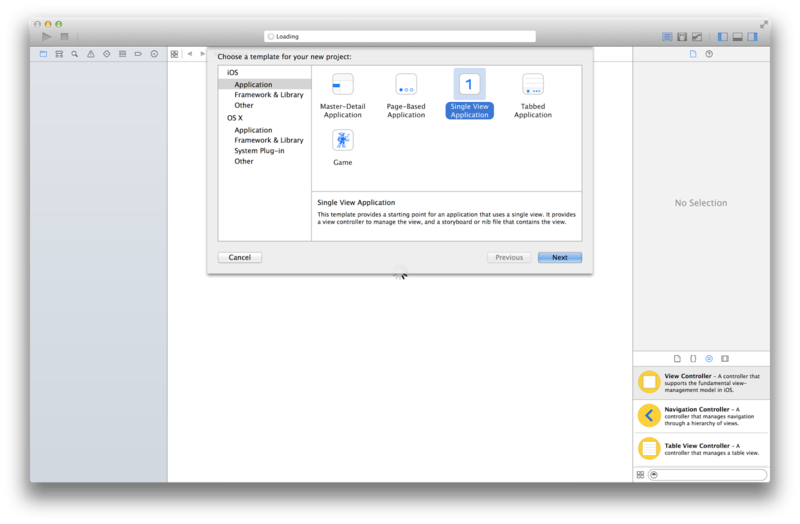 If you are completely new to Xcode, you may find it difficult to navigate the interface. 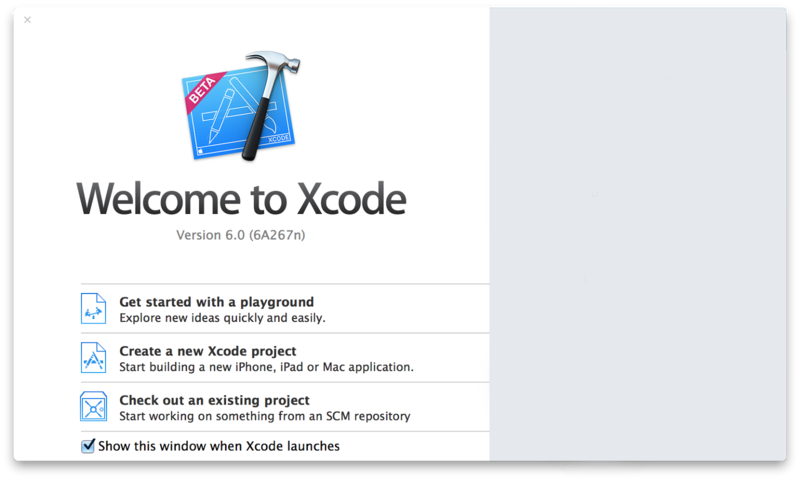 There are tons of great guides to Xcode that can be found online such as this one. 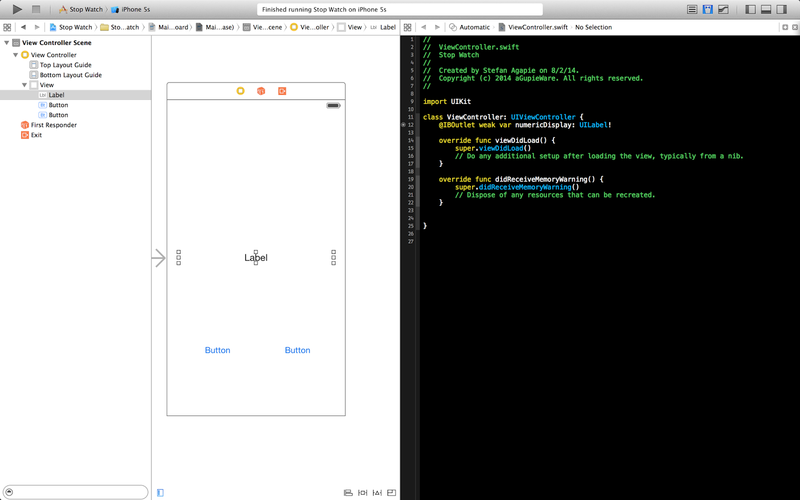 On initial startup, Xcode will present you with its ‘Welcome’ screen and offer several options. 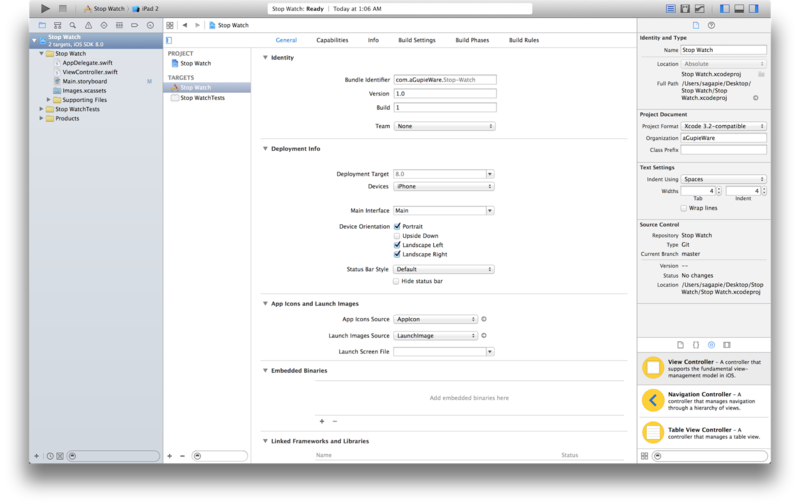 Select the “Create a New Xcode Project” panel from the window (see figure 1). If it does not present you with this screen, select File->New->Project from the menu bar. On the following screen, select “Single View Application” and press the “Next” button (see figure 2). Next, choose the options for your new project (see figure 3) and fill in the necessary fields as you wish, ex. 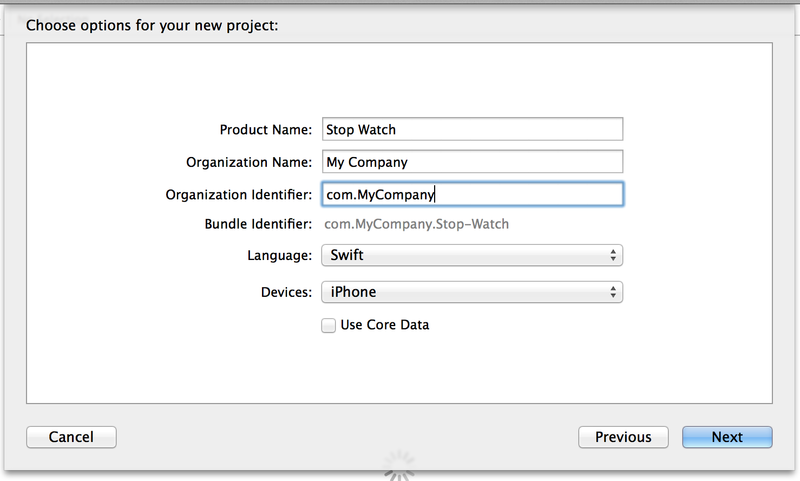 project and organization names, and select “iPhone” as the device, since we are creating an iPhone app. The following screen will then prompt you to provide a destination directory for your project. I like to keep current projects in a folder on my Desktop. There is also an option on the bottom of the screen to place your project under source control. If you don’t know what source control is or how to use it, then simply uncheck this box. (However, it is highly recommended that you invest some time learning about source control systems such as git.) Click “Next” once you have made your selections. Your project should have opened to a screen similar to the one in figure 4. From the device dropdown menu, located in the upper left corner, select iPhone 5s (notice also the other options that could have been selected here if we were planning to create a different app). See figure 5. Now that we have our project’s initial setup completed, let’s get down to business! From the Project Navigator, select the Main.storyboard file. See figure 6. In the Storyboard, select any view, then go to the File Inspector in Xcode’s right panel. Uncheck “Use Size Classes”, and you will be asked to keep size class data for: iPhone/iPad. Then click the “Disable Size Classes” button. Doing this will make the storyboard’s view automatically size with the selected device. See figure 7. 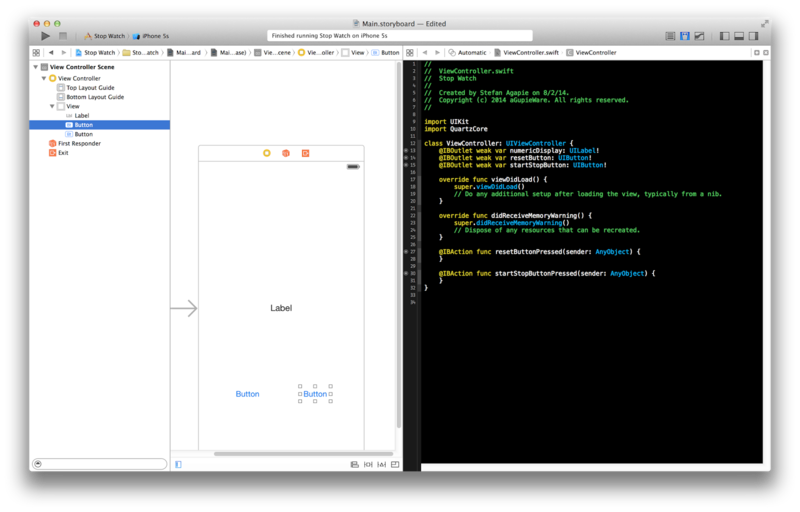 In the top left corner of Xcode, locate the “Play” button and press it to build and run your project for the first time. See figure 8. 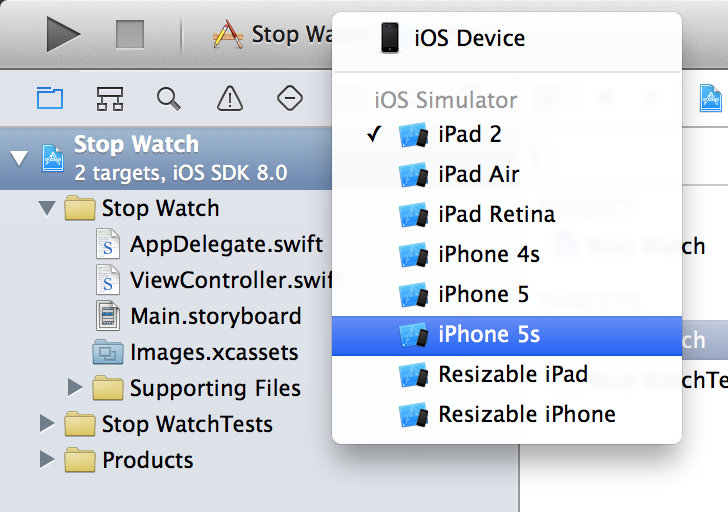 Upon a successful first launch of the project, you should see something like the image in figure 9, an iOS simulator. If you get any errors and the project does not build correctly, read the error report(s) carefully and see if you can troubleshoot the problem. 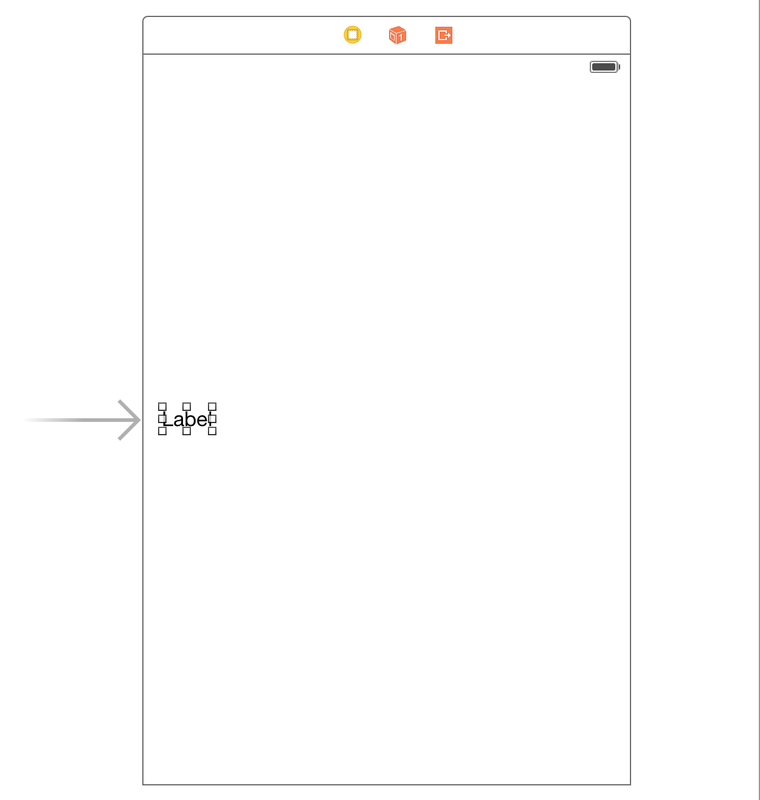 From the Object Library toward the bottom of the right panel in Xcode, select Label (figure 10) and then drag and drop it at the left style guide, but vertically centered into your single storyboard scene/view. See figure 11. The style guides are temporary visual placement lines that appear as you position view elements into your scene. This label will eventually provide the numeric display of our running stopwatch. In order to make the label wider, we will select and drag the trailing edge of our Label element to the right of your scene until it meets the right most style guide. See figure 12. 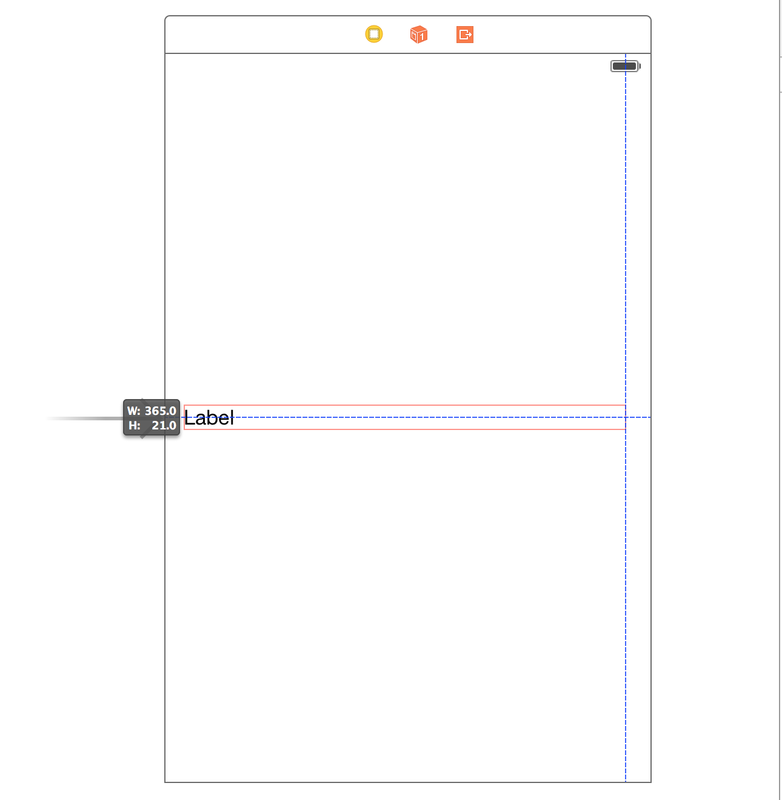 From the Attribute Inspector panel in the right panel of Xcode, toggle the text alignment to center so our text appears in the middle of the label. See figure 13. Go back to the object library and place two Buttons equally spaced apart about midway between the label and the bottom of our scene. See figure 14. These will function as our reset button and our start/stop button on the stopwatch. From the Size Inspector in Xcode’s right panel change, the width of each button to 60 points. See figure 14.1. Run your project to see what it looks like. Again, if you get any errors and the project does not build correctly, read the error report(s) carefully and see if you can troubleshoot the problem. 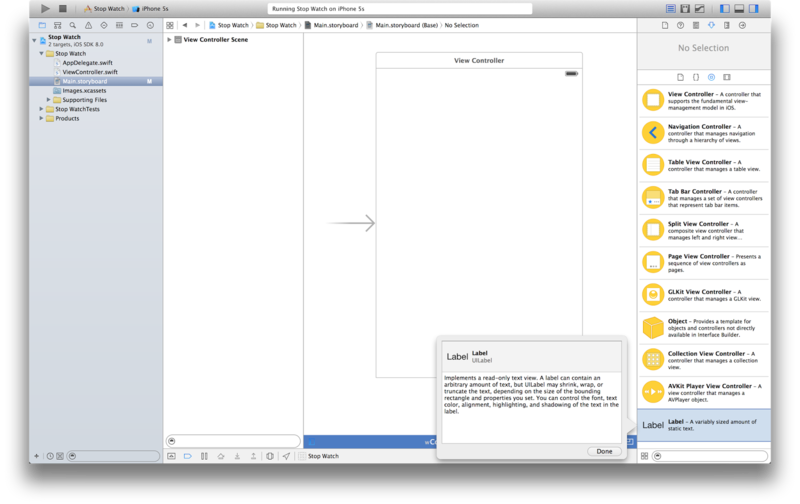 Select the Assistant Editor from the top right corner of Xcode to display the storyboard and associated Swift file side-by-side. Now hide both the Navigator and Utilities panels by clicking on the appropriate panel buttons in the top right corner of Xcode. See figure 15. Now let’s connect up our storyboard elements to our controller, which will connect our interface to our code, that way all the relevant interface elements can communicate events to the controller. 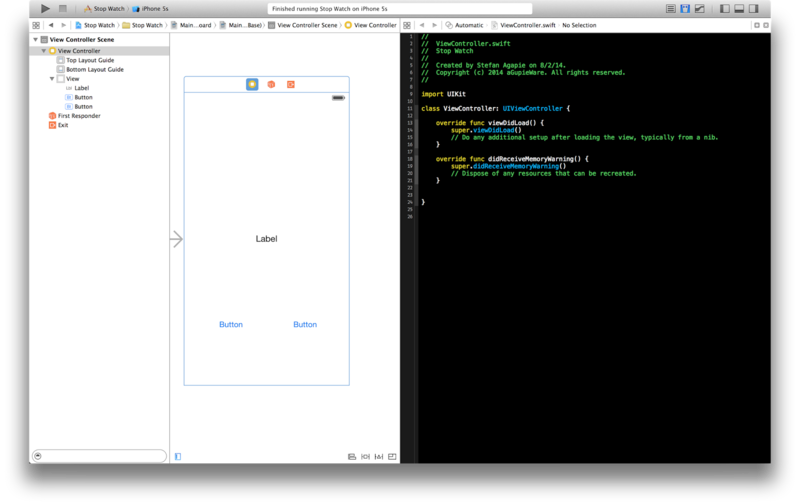 Place your mouse pointer over the Label; then press and hold the control button while clicking and holding down your mouse button as you pan your mouse pointer across the screen and into the right side of Xcode where your Swift file is located. You should see a blue line follow your mouse pointer. See figure 16. Once in the class area, as shown, release the mouse button and the control as well. You will see a dialogue box prompting you for the name of your outlet. Name it ‘numericDisplay’. See figure 17. This will add the necessary outlet code to your Swift controller class. An outlet is a reference pointer to an element inside your storyboard. Creating outlets allows for easy access to objects in your storyboard. After naming the outlet, your screen should look like figure 18. Go ahead and connect the buttons as outlets as well. Name the left button ‘resetButton’ and the right button ‘startStopButton’. In a similar fashion to the newly created outlets, we will now create action methods for each button. This time we will drag the blue line toward the bottom of the file but inside the class body. Name the left button resetButtonPressed and startStopButtonPressed for the right button. In the dialog box, make sure you select 'Action' from the Connection drop down menu. See figure 19. Action methods are the functions in your class that get messaged/called when the button that is associated with the connected method is triggered by an event. An event is initiated when the user interacts with any of your buttons. Your interface should now look like the screencap in figure 20. To accurately update our numeric display label, we need to tie it in to a mechanism that will update at very precise time intervals. To access this functionality, we need to import the appropriate class library. 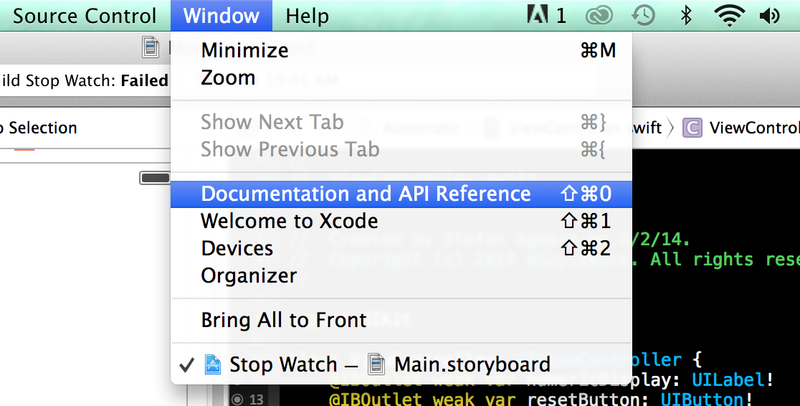 From Xcode’s menu bar, select the Window tab drop down menu then select Documentation and API Reference. See figure 21. The documentation search window should appear. In the search bar type CADisplayLink and locate the appropriate documentation. Read through the documentation and familiarize your self with the CADisplayLink class. This class is very useful when your code needs precise timing control. ‘var’ is short for variable and displayLink is our object pointer of type CADisplayLink. We use this pointer to hold a strong reference to an instantiated CADisplayLink object that we will create in a few moments. We want a strong reference to an instance of CADisplayLink to be able to access it throughout the various parts of our class. We also define a lastDisplayLinkTimeStamp of type CFTimeInterval. This variable will store a running tally of the total elapsed time. The first new line of code above (line 16) creates an instance of a CADisplayLink object, and assigns this class, i.e. “self,” as the target for messages that inform us of a display refresh rate update. This occurs in the first parameter of the CADisplayLink(<first parameter>, <second parameter>) method call. In the second parameter we pass the name of the method that we would like to be called when there is a display refresh rate update. We will define this method shortly. The second new line of code (line 9) ensures that the display link does not begin its updates until we press the Start button in our user interface. The third new line of code (line 12) schedules the display link to begin sending notifications to our instance method about display refresh rate updates. The fourth new line of code (line 15) simply initializes our elapsed time running tally variable. The first new line of code (line 3) updates our running tally. The second (line 6) formats our running tally into a string that only shows the last two significant digits. The third (line 9) updates our numeric display label. Let’s move over to the startStopButtonPressed(…) method. This method is called anytime the user presses the button situated to the right in our stop watch scene. When this button is pressed we want to toggle the display link’s “paused” Boolean value. Add the following line of code to this method. At this point you can run your project and press the start button to see your stop watch in action! Woohoo! Again, if you get any errors and the project does not build correctly, read the error message(s) carefully and see if you can troubleshoot the problem. Our label text string will not be modified if our code does not fall through our first conditional if statement. If, however, the display link is paused, then we check the running display link tally. If this tally is greater than zero, then we display the resume button since pressing this button again will not reset our running tally. If it’s equal to zero then we display the start text. The button text is set in the last line of code. Your final ViewController file should look like this. And that concludes our simple Stopwatch app tutorial! We leave you off with a question for further reflection. Notice that our chronometer output is not formatted for standard time. Our implementation increments our minor units, values to the right of the decimal point, from .00 to .99 before increasing the the major unit by one. Although this is a correct unit of measurement, it is not in the ubiquitous standard time format. In the standard format the minor unit, a.k.a the second, is incremented from .00 to .59 before the next major unit, i.e. a minute, is increased by one. Since there are many ways to implement this, some being more efficient than others, we leave this consideration to the reader as an exercise. Post your own solution below. And, as always, feedback, suggestions, and angry tirades are welcome in the comments. 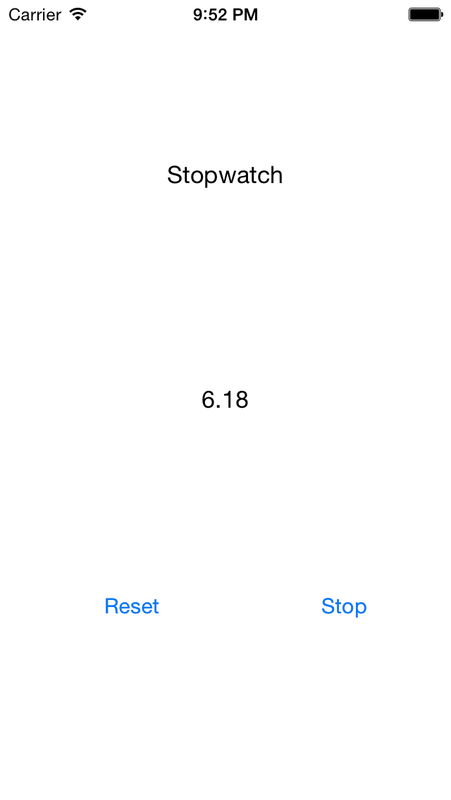 The Stopwatch app and tutorial was originally authored by Stefan Agapie, a Senior iOS Software Engineer, and then adapted for the present piece. Helpful tutorial! But why you didn't used NSTimer? Hey Andrey. From my understanding of apple docs NSTimer is typically used for scheduling that is none animation related. I consider updates to the stopwatch display to be animation related scheduling so therefore we used the CADisplayLink. How would you do this without a resume button? Do you mean just toggle between Start and Stop? I was solving the same problem today and your guide pointed me to the right trail with CADisplayLink and other hints. Thank you so much. This iphone spy app would be a great help for everyone interested in various security issues. Thanks for sharing! It's really great and useful tutorial, especially for junior mobile developers. Can you recommend me nice tutorial for Android? I need one for my co-worker from our app development company. Please let me know :) If you are curious, you can check our projects on IoS. We created some great app (https://zaven.co/projects). Greetings from Poland!